It’s easy to see, looking at Ellie Hendricks, that one’s time in the big leagues is a state of grace. It’s not always so easy to see that the same can be said about one time’s here on earth. February, the winter starts getting long. You slog through the slush. You stare out dirty windows. You get sick. You worry. You get older. You try to imagine that first sunny day far away. Ellie Hendricks putting on his big league uniform once again. Ellie Hendricks grabbing a bat. Ellie Hendricks pausing for a moment, bat on shoulder. Ellie Hendricks smiling in the sun. Earlier in this meandering piece I mentioned the feeling of being 22 and 23 and not knowing if it’s all still to come or all already gone. I thought when I wrote those words that the one concrete detail that I imagine as the center of these current ramblings, the blue jacket, came into my life when I was 22 and 23. But this morning when I checked a cultural event that I loosely associate with the blue jacket—the day Kurt Cobain blew his head off—I see that I was actually 26. Everything else was pretty much the same. Still working at the liquor store. Still wondering if it was all already gone. Still staring out dirty windows, waiting, trying to imagine. When Ellie Hendricks was 22 and 23, he was not far removed from being released by the major league organization that had signed him (the Atlanta Braves). Before that release, he had played minor league ball with, among others, Pat Jordan, the highly touted pitching prospect who would never reach the major leagues and who would brilliantly recount that failure in his book A False Spring. Jordan, who has gone on to become one of the best sportswriters of his time, got down on the page better than anyone ever has the wrenching heartbreak of having the dream of a big league career crash. Though Ellie Hendricks seems by all accounts (including Jordan’s in A False Spring) to have been someone in possession of a much more unshakably upbeat disposition than the smoldering, angst-ridden Jordan, you have to assume that Hendricks also felt the sting of being cut loose from the dream. But while Jordan reacted to this in a way similar to my own reaction to being kicked out of childhood—by starting to try to get the words down—Ellie Hendricks kept playing. He played in the Puerto Rican leagues and became, for several years, a power hitter of such renown in those parts that he was known (for reasons I don’t quite understand, given the location of the leagues and Hendricks being a native of the Virgin Islands) as “The Babe Ruth of Mexico.” When he was 26, presumably in some ways still waiting and imagining, the big leagues finally took notice. The next season he was playing for the Baltimore Orioles, basking in the glow of that rare state of grace. You wait for the call. Hey, I need you. You wait to hear those words. When I was just about to turn 26 and slouching through another February at the liquor store, I got such a call, it seemed. The woman on the other end had an English accent. She was friends with an English woman I’d met at a short story workshop. The woman on the phone worked for a publisher in London, and they put out books on popular American culture. “Are you familiar with Pearl Jam?” she asked in a thrillingly refined accent. I had a vague and faintly sour conception of the band she mentioned. A pack of stout longhaired galoots moaning and yowling. They were relatively new and huge, of course, and at that time I had adopted a general philosophy that anything that hadn’t already happened—in music, in movies, in books, in life—was (not counting a few exceptions) part of a hopeless, hackneyed, annoying aftermath. “Yes, I know Pearl Jam,” I said. “How would you feel about writing a book about Pearl Jam?” the English woman asked. If you wait long enough, you can make a call seem like the call. “I’d feel. I’d feel great,” I said. Ellie Hendricks leaned on love. Surely it was his dream to reach the big leagues, but he didn’t put the dream before his love of the game and of, one has to believe, life itself. “But one must look beyond the field to get the full measure of this giving man,” writes Rory Costello in an excellent installment on Ellie Hendricks in the inexhaustible, ever-growing wonder that is the Baseball Biography Project. Hendricks played for several years in the big leagues, and continued on as an Orioles coach for several more. Once he got to put on that big league uniform, he never wanted to take it off, becoming for the Orioles what Johnny Pesky is to the Red Sox, a common denominator across the years, a human heart beating at the center of an organization. 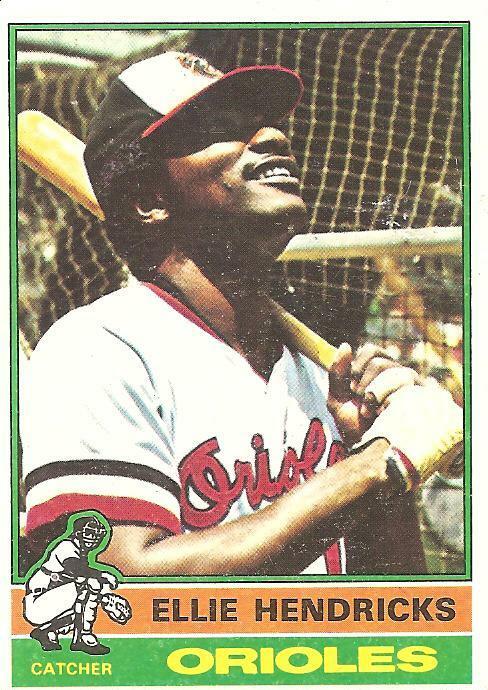 When he died in 2005, he had been soaking up the sunshine in an Orioles uniform for 37 years. There was no big league uniform for me to slip into when I began working on a book about Pearl Jam. But on my 26th birthday my mother, who had apparently deemed the torn Corvoisier windbreaker I’d been shivering in as an unworthy guard against the weather for her son, got me (yes, finally we have come to it) a blue jacket. It was, unlike childhood birthday gifts, not an immediately thrilling present to receive, but it played a key role in the fantasy I was about to enact for the next month. A second key part of the fantasy was the book on Pearl Jam, which I began researching by reading articles about them on file at the public library at Lincoln Center. A third part of the fantasy was a woman whom I somehow began to date. I don’t fully remember how I got that last ball up in the air, so to speak, but it’s not important for this story. What’s important is that I hadn’t dated a woman in years, and that I seized on this woman as if she were a vital key to gain entry to some state of grace. For a couple weeks there, with my new blue jacket, and my Pearl Jam book, and my girl, I was, I tried to believe, in the big leagues. I was still pulling my regular shifts at the liquor store, but in my free time I was striding around town in my blue jacket with Pearl Jam blasting in my ears. I was going to do it. I was going to change into someone else. Some guy in a blue jacket with a girlfriend and the members of Pearl Jam on speed dial. I’ll save most of the grisly details of the sudden and near-total collapse of this fantasy. I’ve droned on long enough anyway. Basically, there came a point when I had to try to make actual contact with Pearl Jam. I got the number of a publicist and called her. Not long after that, in a cab with the woman I was dating, in lieu of telling her how much I wanted her and needed her now, more than ever, I quoted one of my favorite lines from a Woody Allen movie. “You’re so beautiful I can hardly keep my eyes on the meter,” I said. “Josh, we need to talk,” she said. Then Kurt Cobain blew his brains out. I somehow used this as a reason to back out of my verbal agreement to write the Pearl Jam book, sending a letter to the English woman in which I professed great emotional turmoil about “working in an industry” in which such a bright talent might be tortured to the point where he decided to remove his brains from inside his own head. The letter must have read like the cousin of a suicide note, like a note, in other words, in which the author vows to no longer be a part of waking life if he can help it. And the next day I went back to the liquor store. No Pearl Jam in my ears. No upcoming dates on the calendar. But I still had my blue jacket. And spring had begun. Hmmm…maybe I shouldn’t have read this today, as I watch the snow continue to fall and I loaf around, snowbound with a pounding sinus headache. Spring? When? Anyway…strong stuff, Josh. Thanks. Although, I notice you managed to skip over Hendricks’ brief time as Yankee (He did play in the 76 WS for them). in september 2008, eddie vedder wrote and recorded a song paying tribute to the cubbies, “all the way,” hoping a world series was in their near future. we all want what we can’t have, keeping our eyes focused on that meter. Us Oriole fans also tend to ignore/forget Elrod’s brief absences to both Chicago and NY. He was a class act, emblamatic of when the Orioles where one of the class organizations in the league, and a beloved life-long Oriole through and through! Thanks for the Orioles fan view, tscastle. My omission of Ellie’s brief non-Oriole work (he actually was in the ’77 WS with the Yanks–not ’76–so he presumably got a championship ring that year to go along with the one he earned in ’70) was kind of aimed at presenting him as I imagine Orioles fans might want him to be presented–as an Oriole only. Hate to be a pill, Josh, but it was 1976. Ellie pinch hit in games 3 and 4. And yes, Ellie is forever an Oriole…I was just busting your chops because I know how you loathe my beloved Yankees. August, 1966: Sent from Jalisco (Mexican) to the California Angels in an unknown transaction. It’s hard to believe that Cobain has been dead 16 years. I went back and checked Hendrick’s numbers and I was surprised how little he played on those late 60’s early 70’s Orioles. He never had more than 360 P.A. in any of those seasons. For some reason I always thought he played more than that. I’m not sure but it seemed like during the 60’s to the late 70’s there were a lot more Black catchers in the majors. Then it seemed like there were hardly any during the 80’s-90’s. There were some Latino catchers like Santiago, Alomar, and Irod, but I don’t really remember a prominent black catcher until Charles Johnson in the mid-90’s. His big career highlight was his .364/.417/.727 in 12 AB in the ’70 series. I’m doubt he got a WS ring for the ’77 Yankee team because he barely played on that team (10 at bats) and he wasn’t on the WS Roster. blankemon: I hang my head in shame. My apologies for contradicting the insider knowledge. I oughta know better! He and Andy Etchebarran (sp?) made up one pretty solid all-around backstop for the O’s in the early ’70s. Also, he’s doing a nice job for my Rob Neyer Baseball team (see recent post on Chet Lemon); through 31 games we’re 19-12! Yeah, I recall I never wanted to start Etchebarren when I played those teams in Strat-O-Matic. Hendricks in those peak years was always good for 10-12 homers in under 400 ABs, so his card was always much more tantalizing. In other Strat news, I finally re-played the 1977 WS, and not only did the Dodgers win it in 5 games, but my Yankees scored all of 6 runs in the 5 games. Damn you Don Sutton! Oh well. blankemon: You’ll always have the real life Series! I actually just replayed the entire 1975 Reds season with APBA. Josh, you better have had a good reason for passing on a book about Pearl Jam in the ’90s. I remember in college in Lowell, Massachusetts (Kerouac’s hometown), around 1991 or 1992, ads being posted for a new band playing at the university auditorium. Never heard of ’em. Yup, Pearl Jam. I wish I’d gone, not for the music so much, but just to say I was there. Hendricks stole one base in his major league career, on June 17, 1970 off the battery of Gene Brabender and Phil Roof. Interestingly, both Hendricks and Roof signed out of high school with the Milwaukee Braves in the same year, 1959. They were never teammates in the minors — Roof was on a faster track than Ellie. But I like to think of a couple of young upstarts showing off their throwing arms during spring training those first couple of years, with Roof always soon to head to greener pastures, and then Ellie exacting professional revenge eleven years later. Maybe he even gave Phil Roof a wink and a smirk, who knows? Hendicks had one memorable moment as a Yankee in 1976 that lives on in the vaults of MLB network and Classic Sports. He homered off Mark Fydrich in the legendary Monday Night Baseball Tigers Yankees matchup.